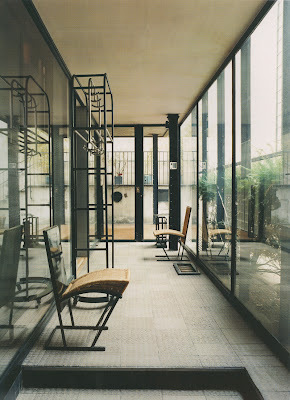 All images and references from La Maison de Verre: Pierre Chareau's Modernist Masterwork by Dominique Vellay and photographs by Francois Halard. 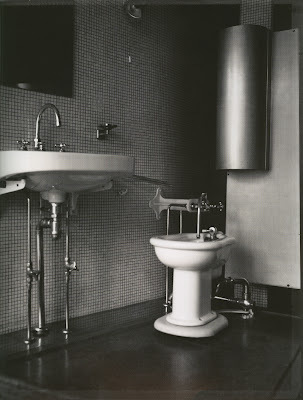 In 1927 Annie and Jean Dalsace (Mme. Vellay's grandparents) acquired an eighteenth century Paris town house with a unmoving tenant on the top floor. Undeterred by their stubborn town housemate, they commissioned their friend, the architect and designer Piere Chareau, to design around that impediment. He removed everything below that top story and turned it into a modernist masterpiece. 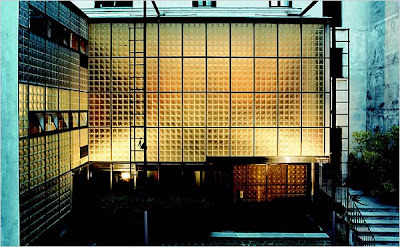 He replaced the walls with translucent glass bricks, installed remotely controlled swiveling windows and divided the interior by perforated metal screens that rotate or slide silently. 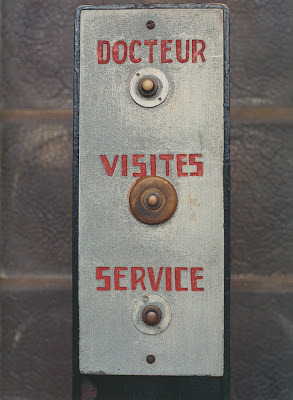 The entrance: Visitors can choose from three doorbells - doctors, visitors or tradesmen. They each have a different sound. 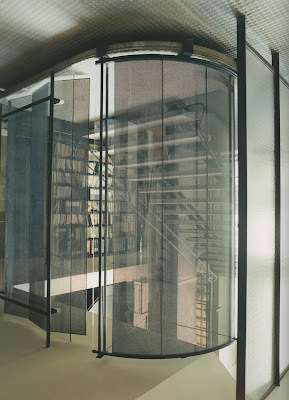 The Great Bookcase: The metal shelving accommodates books, stacked two deep. 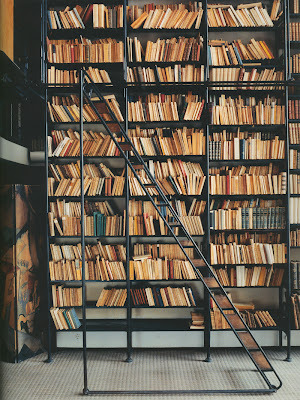 The ladder slides along the length of the shelves. The books reflect a particular moment in history, politics and humanities, expressing the personalities of Vellay's grandparents. On the ground floor, a corridor leads to the main staircase. It is sheltered by a sceen of which the curved section swivels, while the other folds back against the railing. On days when there were guests, both sides were opened. Light filters through a series of screen of different materials. 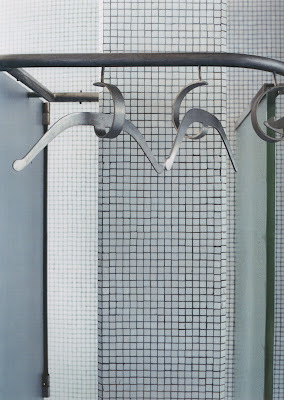 Duralumin coat hangers made to look like mustaches hang in the bathroom. The rubber floored entrance hall overlooking the courtyard. 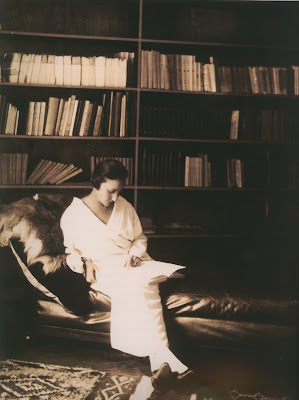 Anne Dalsace, the owner, in her own parents' house in Noisy-le-Grand around 1920. I stole this. I hope you don't mind. I love it.